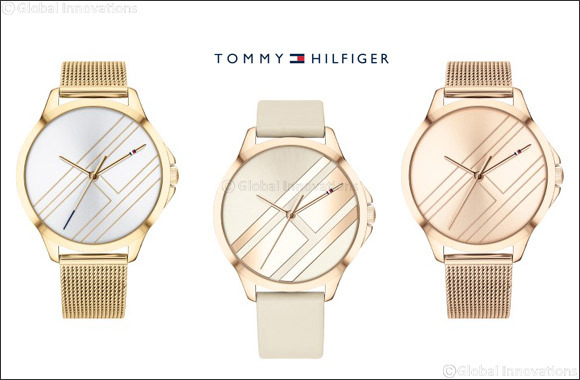 Dubai, UAE, September 09, 2018: TOMMY HILFIGER Iconic Sport men's and women's watch and jewelry collection, featuring minimalist designs inspired by American Icons, putting a modern twist on timeless classics to meet the needs of the now. This season the collection offers modern blue sunray dial with a stainless steel case and bracelet, and a carnation gold bezel accented with crystals. Classic minimalist pieces feature a blue or carnation gold-plated bracelet and case, and a dial with crystal markers, in addition to styles featuring carnation gold plated, stainless steel or gunmetal mesh bracelet, case and dial. Iconic designs include tonal TOMMY HILFIGER flag logo detailing on the sunray dial with a leather, carnation gold or gold-plated bracelet. The Tommy Hilfiger Iconic Sport collection ranges from AED 750 - AED 800 and is available across Hour stores in UAE.